longstanding "my mom warned me to stay away from the bad side of town" sense. What's funny about this is that we're not talking about a large urban area, but a tree-lined planned development that never had an industrial core, never had a neighborhood of tenements or grand houses broken up into apartments, and never had a skid row (except maybe for the old Hunters Woods shopping center, better known as the Retail Complex of the Damned). We're talking about a large real estate development, right down to the golf courses in the middle of it. Still, it's always fun to perpetuate stereotypes, so let's jump on in, with the help of the handy map at right. 1. North Reston. The newest and least Restony part of Reston. There's little of the contemporary 70s architecture, fewer darkish earth tones. If you closed your eyes in some neighborhoods, you could be in a generic Ashburn suburb, only with a few more trees. Often considered the most desirable part of Reston, with the "good" schools (the ones named after astronauts), even though it has the least in common with the rest of Reston. 2. Middle Earth. The oldest part of Reston, which was built outward from Lake Anne. Originally populated by various 60s antidisestablishmentarians who, being the first people in the country to buy townhouses that, strictly speaking, weren't even remotely near towns, must have been smoking something. It still has more of a funky vibe than the rest of Reston. The area's architectural excesses, both good and bad, are concentrated here. 3. Reston Town Center (tm). Home to both Reston's Fake Downtown (which, like Disney's Main Street USA, seems built to 7/8th scale) and a godawful succession of strip malls and condos. But hey -- there's a Macaroni Grill(tm)! 4. South Reston. For various reasons, folks in other parts of Reston find South Reston "scary." There are "projects" there, and "gangs," too. (All of which is true, but there's also crime and low-income housing elsewhere in Reston, even within a stone's throw of the aforementioned Macaroni Grill(tm) and $750,000 condos in RTC.) We're not exactly talking southside here, peeps. 5. Here there be dragons. Herndon -- or as I call it, the "anti-Reston." More on this anon. I would argue that South Reston should be divided in two sections. 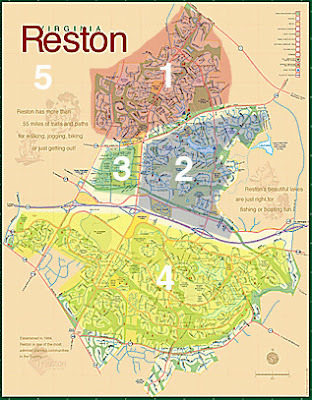 Anything west of Reston Parkway can be called La Restonia. WHY DOES THIS SITE GO TO Dell search every time I skip around trying to read different areas. Is someone out there in the ether trying to mess with the site? Each area has different classes of homes. South of the toll road is twice the size of the other areas and so has more gray spaces. It also has more two massive lakes with awesome homes surrounding them. Including those on Upper Lake, Lakeport, Beacon Heights, Boatport... to name a few. The homes of South Reston are affordable, unlike those of Lake Anne the condos have reasonable fees. I grew up in Reston (in "Middle Earth") and just found your blog. HILARIOUS. I actually remember shopping and eating ice cream at Hunters Woods. The "bad" neighborhoods in South Reston were about two clusters though, if I recall. 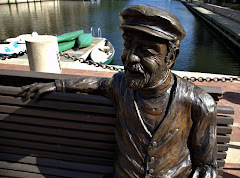 I have lived in Reston for about 4 years, I have never seen so many snobbish rude people in my whole life and why I have no clue it is really not such a great area cant wait to get out of here!!!!! I live in South Reston west side on Reston parkway,and I hate it! My neighbors are awful. I moved here from another state so I didn't know the area that well, now I do and I cant wait to move!!! To anonymous with Dell problems. You have probably infected your computer with MALware...bad stuff. See a someone to clean your computer.